The mural was commissioned for an enclosed subterranean area with reduced natural light. The idea was to enliven and brighten the walls and reduce the sense of enclosure. Inspiration for the mural was drawn from Livia's Garden Room in Pompeii a fresco mural painted in an underground room in about 15 B.C. A mural painted with similar objectives in mind. 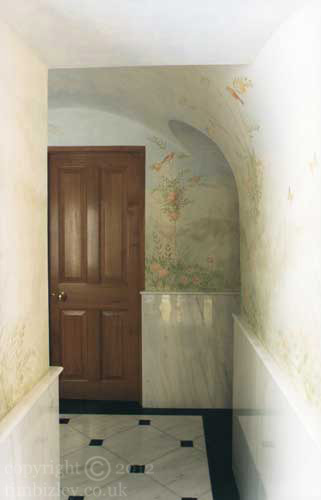 Commissioning a specialist decoration faux fresco mural is akin to commissioning a painting, and a good muralist will always be able to offer design advice and guidance. Murals are an ideal way to create dramatic transformation of walls and interiors and offer the opportunity to design highly bespoke and individual homes. The huge variety of styles of painting and the open ended use of colour can accommodate many briefs and divergent situations, with the objective of creating unique interiors that are fine tuned to the requirements of the space.